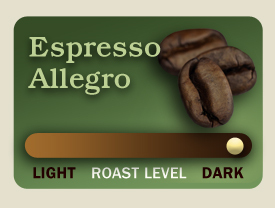 Espresso Allegro is a dark espresso blend. We formulated a secret combination that will make fantastic espresso, intense flavor yet smooth on the palate. Will hold up well to milk. Excellent dark roast drip brew or espresso drinks.